Once others expect hugs from you, they will even beat you to them! This can be anybody. Start with someone like a family member, and work outwards from there. Adults tend to equate touch with sexuality, so it takes some trust and balance to get comfortable. In no time you’ll be shunning the impersonal handshake and instead inviting hugs–even with strangers. Just look the person in the eye, open your arms, and smile. If they need a little extra encouragement, simply tell them you are a hugger. I especially love bringing hugs into the workplace. It makes it a much happier place to spend 8 hours a day. Those hugs we receive from an arm’s length away seem phony and forced. To be a good hugger, you have to give in and be willing to share your personal space. Get rid of that extra room between your chests, and truly embrace the other person. Try swapping your head to the opposite side. Hug with your heads over each other’s left shoulder instead of the right. This places your hearts in alignment, and creates a more endearing hug. To create a connection that will set your hugs apart, allow yourself to become aware of the breath in the other person. Remain still long enough to mindfully transfer thoughts of love and oneness. This can be done in as few as 7 seconds (one good inhale & exhale), but to really feel the power of this connection try it for up to 30 seconds. Tandem breathing is an excellent way to understand the process of giving/receiving and acknowledge our unity. Keep hugging. Like anything else, it will get easier with repetition. Try jumping in on a group hug. 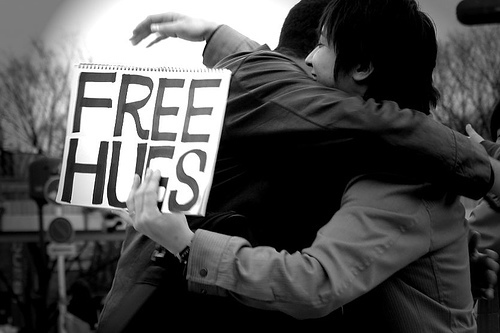 Hold a Free Hugs event in your area. Teach someone else. I’m not afraid to call someone out on a sloppy hug, and make them try again. They will appreciate your authenticity in reaching out to them. Once others expect hugs from you, they will even beat you to them! As an avid hugger, it’s a test for me to be living in a country where any public displays of touch and affection are socially inappropriate and uncommon. I have pushed the envelope by hugging several Thai adults that I encounter on a daily basis. I get an awkward response, but I am not giving up! Goal 2 of Peace Corps service is sharing American culture abroad, so the way I see it, this allows me to stretch my job description to include handing out hugs. Does that count as proselytizing? It amazed me to realize how affected I was by lack of human contact during training. Thank goodness Lilia showed up 10 weeks later! Though I am not currently getting my Recommended Daily Allowance of hugs, at least I manage some weekend squeezes with other foreigners! I can’t wait to get my hug! The whole time I was reading this, you’re the person that came to mind as having written the article. Glad you’re bringing hugs to site. Good goal 2 project. See you at reconnect. Hugs! !